I have to say that the first thing to come to mind when I decided on the prompt word “resolution” was the talk around the Christmas dinner table of our friends’ new 4K television. I had no idea what “4K” meant until someone explained to me that it was the screen’s resolution. It’s apparently (the picture, that is) more real-looking than real life. Enough to make you wonder what, exactly, it would take to really make our eyes work to their fullest. Maybe there’s more than just corrective lenses. Then there’s the resolution on the screen of my new laptop. Yes, I had to buy one. The old one keeps crashing on me, which means it’s unreliable. Also the internal battery is almost dead and I keep getting a message to say the display driver has stopped working. As I can’t work without a computer, I had no choice. … that’s my story and I’m sticking to it. Windows 10 is going to take some getting used to, as well as the new mouse pad that I can’t seem to fix to stop opening things I just want to scroll past. I may have to contact tech support for that one, as it’s really annoying when I want to stay in the chapter I’m working on in Word. Grrr. Speaking of chapters, I’m getting my second book in the The Great Dagmaru series ready for beta readers. I hope to publish it in February! Which brings me to my new year’s resolutions. First, get book two and maybe even book three published. I’d like to make the time to take more courses this year, as I only have five years to get them all done for my editing certificate. Money’s an issue, as is time, but it’s a bit of a conundrum as I can make more money if I have the certificate. Kinda like not being able to get a job without the experience, and not being able to get the experience without a job. I’ve always found that to be extremely frustrating. Where was I? Oh yeah, resolutions. I got a Fitbit for Christmas, so I’m going to try to use it as motivation to get moving a bit more. Since I started editing full time, my weight has gone up and my fitness level is in the basement. I have to change that for the good of my well-being. I think it’s been three years now since I made the resolution (added to my wish-list?) the goal of spending one weekend alone in my house. It hasn’t happened yet, but I’m sure this will be the year! I’d also like to go on some sort of vacation this year, but I can’t see it happening at this point. Again, money (or lack thereof). I’m really loving this new laptop screen. Suggestions for Netflix movies are welcome. Categories: Blogging, Blogs, Life, Random, Stream of Consciousness Saturday, The Great Dagmaru | Tags: editor, fitness, inspiration, New Year's Resolutions, publishing, screen resolution, SoCS, writing prompt | Permalink. I absolutely love your resolution to just spend a weekend alone at home, how absolutely magical to just be still and happy in your own space, it’s a fantastic goal! 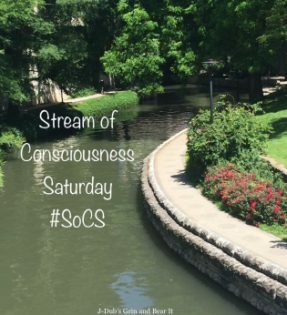 I think your SoCS this week actually helped to get me out of a long long funk. I hope it is just not the 24hour muse flu [chuckles at the absurdity of that phrase]. I see resolution this time of year and I usually shut off the idea but your prompt made me think and think and think. Thanks, kiddo, and Happy New Year to you and your family. May each day feel like a fresh new day this year [smiles]. Here are a few movies I will suggest and knowing you have Netflix, I will let you know when I see something extra good. You’re welcome. Started watching the series Lethal Weapon and I know it is violent but for some reason I enjoyed the humour last night. Happy New Year Linda! Looking forward to the next book. Don’t feel bad. My battery was swollen (their words), the trackpad wouldn’t work, and the keypad failed. Luckily I was able to get it all replaced. 🙂 (Mine is an Apple laptop). I’ll be the first to admit I got lucky and didn’t have to buy a new one. Cheers! I resolve to travel more, in the new year, but money keeps getting in the way, or lack-there-of as you say. It never ends, and it goes on and on. Needing a new laptop. Glad you are writing and hope the editing training can continue. Happy 2018 Linda. Here’s hoping you get everything you need and a few things you want, to boot. Thanks, Kerry, and happy new year! I love your resolutions! Good luck with getting those books out…that sounds amazing. Happy new year! My husband bought me a fitbit for Mother’s day and it has helped a lot with motivating me to move. I hope you find yours useful. I thought 4K was a race. Love my mouse pad ever since the mouse pad made my thumb cramp up. Best wishes on that weekend alone to yourself and for a wonderful and prosperous new year! Makes you wonder if mice are in part the reason for carpal tunnel syndrome, doesn’t it? I feel mouse usage in my shoulder more than anything. It’s necessary to get it in the right place! That 4k TV is science fiction, hocus pocus. I watched one and could not tell any difference. All TVs made these days have resolution that look crisp and bright to me :). Maybe there is something to it and my corrective lenses get in the way. Happy New Year Linda! You are a blessing! The hostess with the mostest! Thanks for all you do for us. The second seat on the right series, #SoCS, #JusJoJan, #1linerWeds to name a few. I use my laptop on my lap (or on a tray table in plane/train). I use a wireless track ball (thumb powered). I love it and you can use it anywhere. Mine is usually on my leg. My last laptop had a super sensitive touch pad and it made me CRAZY. Good grief, I’ve had Netflix since before people knew what it was, I wouldn’t even know where to tell you to start. I’ve seen some 4k displays. Ratatouille. We watched that on someone’s 4k. We haven’t recovered, lol, we’re still talking about it! Loved Dexter, and Downton Abbey, which you suggested. 😀 I’ve heard a lot of good things about The Crown – I may make that my next series. Thanks, Joey! Haha! Yeah, I was the same after I saw Shrek on DVD – it was our first. Just sooo awesome after watching VHS for years. Good luck with your resolutions and have a happy New Year. Happy New Year Linda, I nearly wrote about screen resolution… But went for the obvious instead. As for Netflix recommendation, Expance, Mars, The Crown, Bright. Thank you, my dear Willow. ❤ A very happy new year to you too. Yes we watched Bright Boxing Day evening and I enjoyed it very much as did our middle son oldest son and hubby thought I was okay.. I liked it!! Happy New Year, Linda. I have no Netflix suggestions. Haven’t used the service in years. Any good movies you’ve seen on TV or in the theatre? Most of them are there. Good luck with Windows 10, Linda. In keeping with your episodic bus series, try “Shot In The Dark” on Netflix. Oooh, I’ll have a look at that. Thanks, Allan! Happy new year! Have fun with the new computer, and you might want to get an actual mouse for it. Those trackpads are nuts…. Right? But if I get a mouse, I’ll need a desk or table to go with it. Then a chair … Mice are expensive when you think about it. Haha! I cannot live without a mouse! Good luck with all your resolutions and hope to read another of your books soon!!! Thank you! I’ve been meaning to watch Dr. Zhivago for years. I’ve seen The Notebook a few times – will look up Body Heat. Thanks!